Please note: The text below is presented for information purposes only and is not intended to diagnose, treat, cure, or prevent any illnesses. Until recently, the cranberry was much overlooked as a source of nutrition and this little red berry had been relegated to being served up in a sauce with turkey dinners. But researchers have been finding that there is so much more to cranberries. They are an excellent natural source of a number of important nutrients. Research into the nutritional content of cranberries has intensified in the past several years and new findings on their health benefits are being released regularly. There is no question that cranberries are packed, absolutely loaded, with Vitamin C. 100 grams, or about one cup of cranberries provides 22 percent of the recommended daily intake of this important vitamin. While some still argue that synthetic Vitamin C, or ascorbic acid, is as equally effective as any natural source, nutritional supplements derived from natural sources are gaining in popularity. This may stem from the belief that as good as modern science is, it still can not top Mother Nature. Many of the nutritional benefits of Vitamin C have been known for some time. Regular intake of this essential vitamin is known to be very helpful in warding off colds, in addition to shortening the duration and reducing the severity of symptoms when colds do occur. And Vitamin C is important in a number of other ways too. For example, it is vital in the bodies production of collagen, a protein that plays a main role in the development and maintenance of healthy teeth and bones. Collagen is the main component in cartilage, ligaments and tendons. Vitamin C also helps in the bodies synthesis of a neurotransmitter called norepinephrine, which is required for healthy brain function. As research into the health benefits of Vitamin C continues, scientists are finding indications that because this vitamin is considered to be a powerful antioxidant, it may be helpful in slowing the ageing process and treating some kinds of cancer. Evidence is also being found that Vitamin C might be useful in the treatment and/or prevention of cataracts, heart disease, lead toxicity and stroke. Antioxidants are needed in the body to combat free radicals, which are looked upon as very undesirable bad guys at the molecular level. Antioxidants have been cited as playing a part in a number of illnesses and even the ageing process itself. Potential health benefits of the cranberry do not stop with Vitamin C. Cranberries contain some other very interesting nutrients as well. 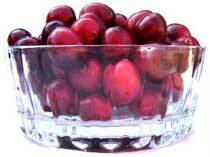 Another component of cranberries is Beta-Carotene. Beta-Carotene is also an antioxidant and is one of the ingredients that give cranberries their red color. Beta-Carotene is classified as a precursor of Vitamin A. This means that once consumed, Beta-Carotene is converted into Vitamin A by the body. Vitamin A is an essential nutrient for a number of reasons, but it is best known for its part in providing healthy vision. Cranberries also contain Flavonoids, an interesting nutrient that is often overlooked. Flavonoids, sometimes called bioflavonoids, is actually a label that covers a group of about 4,000 different compounds that also give the cranberry its color. It has been know for some time that Flavonoids help the body make better use of Vitamin C.
Flavonoids are also antioxidants and research continues to determine just how powerful they are in this regard. In 2010, the much respected British Journal of Nutrition published the results of a study on the effectiveness of dried cranberries in men with lower urinary tract symptoms(LUTS). "The present results show that dried cranberries improve prostate health very effectively" "Unlike currently used medication for prostatitis and LUTS, cranberry has no adverse effects" and "Cranberry is also recommended to women with recurrent urinary tract infection" were among the conclusions of the study. The study was conducted using dried cranberry powder, which is available in capsule form at most health food stores for those who prefer popping pills. But the study also mentioned "Use of the whole berries may be more beneficial than single components" a reference perhaps to the fact that heavy processing greatly diminishes nutritional content of food, most notably Vitamin C. So the consumption of low process cranberry beverages and snacking on dried whole cranberries might be more advisable. Recent research suggests something in the cranberry may be very effective in fighting cavities and gum disease as well. While the cranberry is packed with a number of important nutrients, it contains lower levels of potassium than found it some other fruits. And, as it turns out, this is a good thing. Increasingly, doctors treating patients for high potassium levels are suggesting that a switch from orange juice to cranberry juice would be beneficial. The Mayo Clinic reports that potassium is critical for the function of nerve and muscle cells and that while blood potassium levels should range between 3.6 and 5.2 millimoles per liter (mmol/L), potassium levels higher than 7.0 mmol/L can be dangerous. Proanthocyanidins are natural active chemicals in cranberry juice. It has been found that Proanthocyanidins may prevent bacteria from sticking to some cells in the body. Laboratory research shows that these chemicals block Haemophilus influenzae, a type of bacteria that is present in up to 75 percent of the population and a common cause of ear and respiratory infections in children. Ongoing research is looking at a number of other health benefits of cranberries. 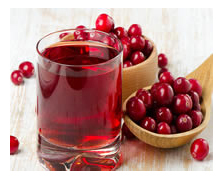 Various nutritional components in cranberries and cranberry juice are being considered for the treatment and/or prevention of a number of ailments.